"I am so delighted that a first studio recording has become a reality with my group Group S.
First of all, as some of you may know, Group S is a re-naming of my group SaxAssault. It felt a good time for a name change, and reflects the music and personnel better then when we started 22 years ago. Why Group S? A few years ago I found myself in the privileged position of being in the sax section of the Royal Liverpool Philharmonic Orchestra (along with Rob Buckland, Mike Hall & Carl Raven), the soloists being the Wayne Shorter Quartet. Conducting the RLPO on that gig was Clark Rundell, who kindly introduced the sax section to the great man. I asked him 'what do you call a group of saxophonists? ', he paused and gazed, looking up, and said 'Group S!'. Since 1994, when director at the famous Manchester music venue Band on the Wall Ian Croal approached me about starting a large ensemble comprising saxophones and rhythm section, it has been a dream to record a studio CD. SaxAssault recorded its debut CD Bang! 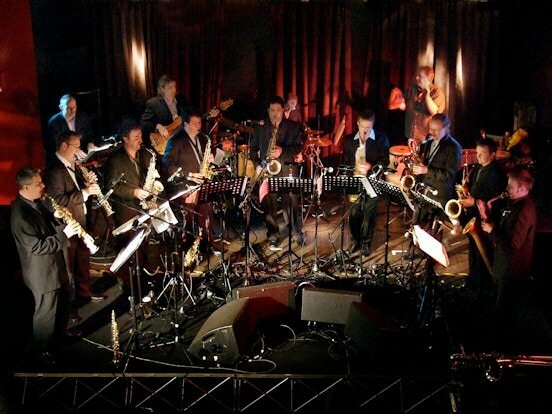 live at BOTW in 1995, and as crazy as it is to form a 13-piece ensemble (logistically and financially) it's something that has continued, with a second live CD Sax of Gold recorded in 2007, with guests Bob Mintzer (tenor sax) & Gwilym Simcock (piano). Along the way I've organised short tours, and one-off concerts such as being invited to perform at the Jazz Night Gala Concert at the World Saxophone Congress in Slovenia (2007) in a double bill with the Yellowjackets. More recently SaxAssault was invited to perform the closing Gala Concert at the World Saxophone Congress in Strasbourg (2015). It was in Strasbourg that my dear friends Jon Hiseman & Barbara Thompson suggested that we should record a first Group S studio CD, in their London studio. From mid-July 2015 following on from the Strasbourg concert to 2nd January 2016 I plotted and planned to make this a reality. To secure the musicians of the highest calibre that perform with Group S meant a lot of diary checking and a huge amount of careful thought was given to the music that would be recorded on the CD. In Strasbourg I had added guitar to the group for the first time live, and I set about writing new music, re-voicing and checking any existing charts that were to be recorded, all the time thinking so carefully about the balance of tracks on the CD, giving all the players enough musical elbow room to be happy, and planning all the travel, accommodation and food and drinks! My musical aim with Group S is to feature the classical/contemporary musician as equally as the improvising musician, to write for specific musicians, explore solo and ensemble colours and textures, and to try and develop my own writing over time. On the new CD you will hear; Rob Buckland (sopranino/soprano saxes), Krzysztof Urbanski (soprano sax), Simon Willescroft (alto/soprano saxes), Dave Graham (alto sax), Mike Hall (tenor sax), Rob Cope (tenor/baritone saxes), John Helliwell (tenor sax), Chris Caldwell (baritone sax), Jim Fieldhouse (bass/baritone saxes), Gwilym Simcock (piano), James Pusey (guitar), Laurence Cottle (bass guitar), Elliott Henshaw (drums), special guests Barbara Thompson (tenor sax) & Jon Hiseman (drums), and myself (tenor sax). As on previous CDs, it's a pleasure to include tracks from players in the ensemble, and on the new CD I'm delighted that Gwilym Simcock has contributed three tracks, as well as works by Mike Hall & Rob Cope. This recording simply couldn't have happened without Jon Hiseman & Barbara Thompson, I'm forever grateful. I'm also grateful to Rob Buckland who co-produced the CD with Jon & myself. I'd love to talk here about each CD track and how stunning the playing is, however that is included in the CD liner notes. Since the group was formed in 1994 I have had the absolute privilege of working with wonderful musicians that have played with SaxAssault & now Group S, inevitably a large group of this nature requires a pool of players, and everyone that has played the ensemble has been a pleasure to work with."